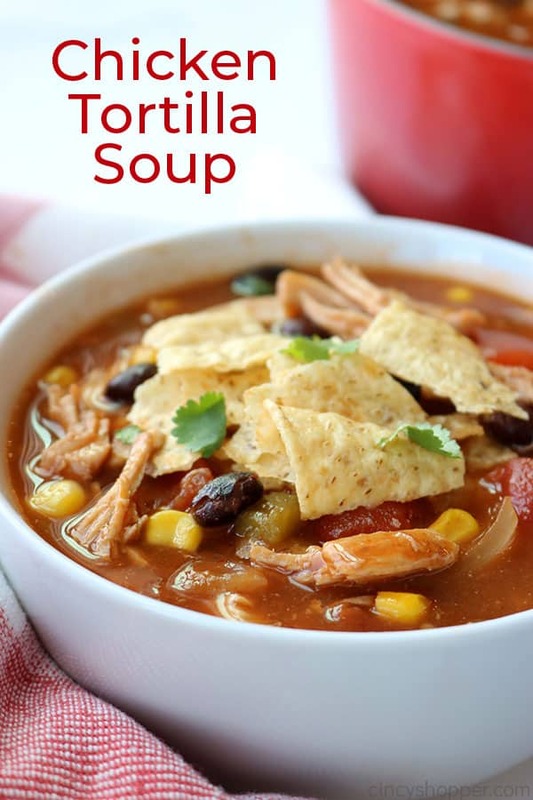 If you are looking for an easy and hearty soup recipe, you will want to make this Chicken Tortilla Soup. It’s loaded with shredded chicken, tomatoes, corn, black beans, onions, and green chilies, all in a tasty broth. We then serve with crushed corn tortillas. Add in some additional toppings or enjoy as is. When I am eating out at a restaurant, one of the first things I look for on the menu is soup. I always have to know the soup of the day or the regular soups that are offered. Soup and salad are staple sides for me. I just have to have them. 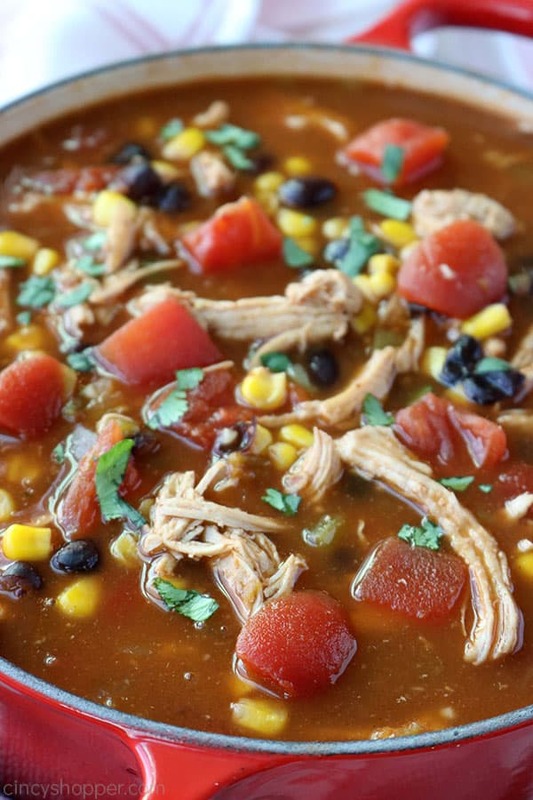 Many restaurants now offer Chicken Tortilla Soup on their menus. I order it quite a bit and it has become one of my favorite soups. If you have yet to try it, you are really missing out. During the winter, I serve soup and salad or soup and sandwiches for dinner frequently. I make our Homemade Chicken Noodle Soup to serve with grilled cheese as a meal. I also whip up our CopyCat Panera Broccoli Soup because my family requests it so often. When I make our Homemade Chicken Tortilla Soup, the whole family gobbles it up and I never have leftovers. 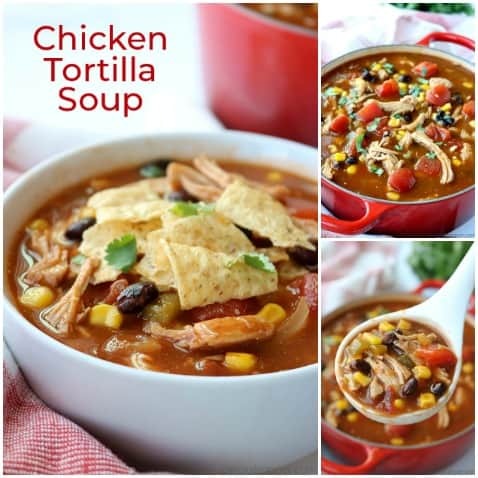 When making Chicken Tortilla Soup, I usually pick up a store bought rotisserie chicken. Having the chicken prepped makes this recipe so super easy. I toss everything in a pot to simmer for about 45 mins. If I am not pressed for time, I will make my chicken breasts in a pan with a bit of oil, salt, and pepper then shred. It does not take much time but does add to the prep. On busy weeknights, I like to keep all my cooking as simple as I can. I have made this recipe so many times since I perfected it years ago. I think I have the broth perfect. It has just a bit of spicy flavor. Adults and the little ones will enjoy it. 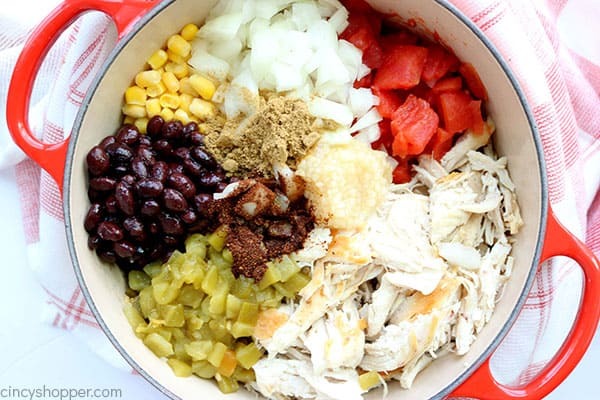 If you need to make kid friendly Chicken Tortilla Soup,you could puree the onions and green chilies. You could leave out the onion but I highly suggest keeping the green chilies for the added flavor. I have made my own corn tortilla strips in the past. 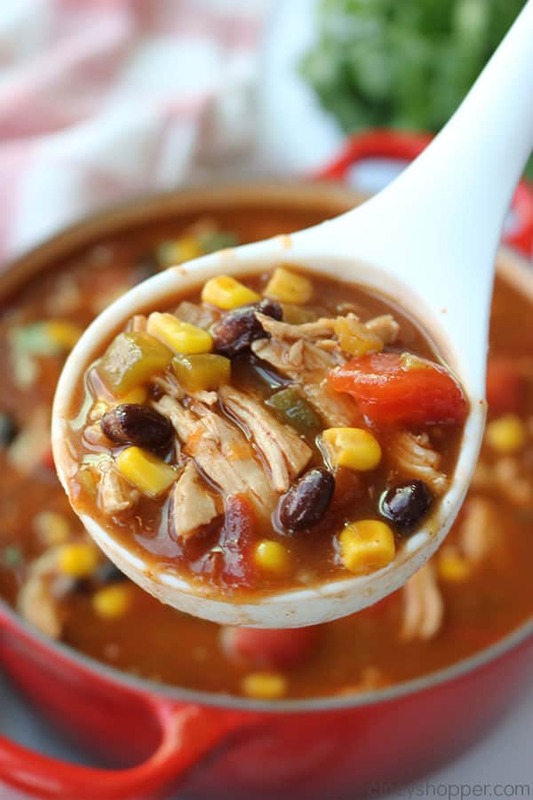 It is easy to do but I like to keep the prep time for our Chicken Tortilla Soup to a minimum. I just use store bought tortilla chips. I just crush them up. I add some crushed chips to each bowl before I ladle the soup. They never get to soggy and really add the tortilla flavor. I also serve additional crushed chips along side to top our soup. I make chicken for dinner frequently. Plain chicken breasts can become quite boring. I like to mix things up a bit and make chicken casseroles, soups, and chicken sandwiches. Chicken in general is healthy, inexpensive, and is easy to cook. 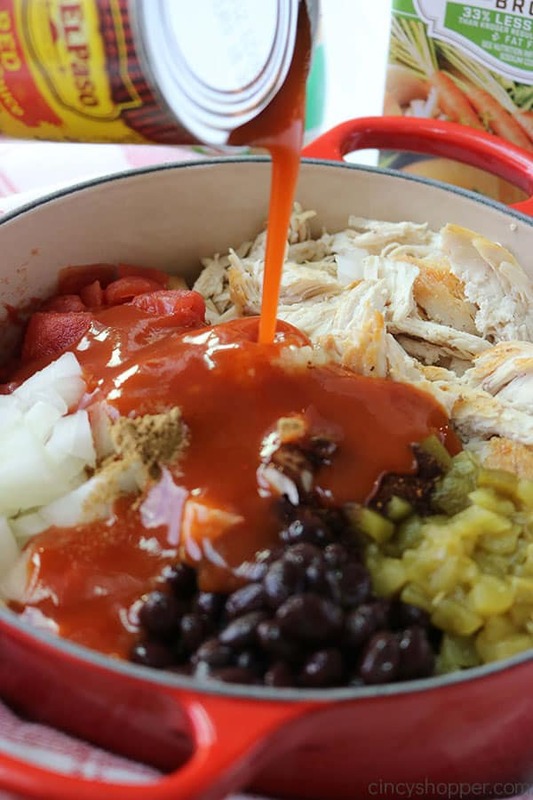 Adding a variety of flavors with with the chicken always makes dinners less boring. 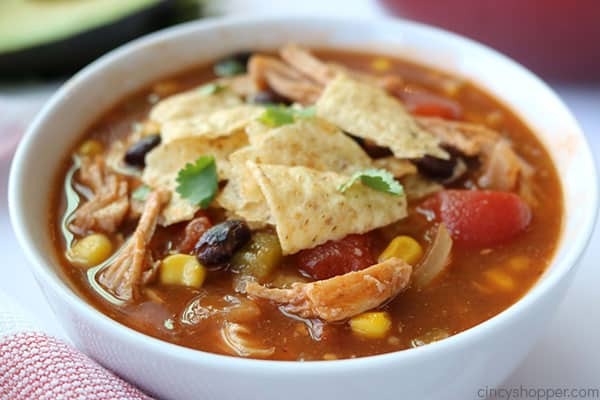 I have had our Chicken Tortilla Soup recipe in our dinner rotation for years. I make it during the winter and summer months. We make it every few weeks. 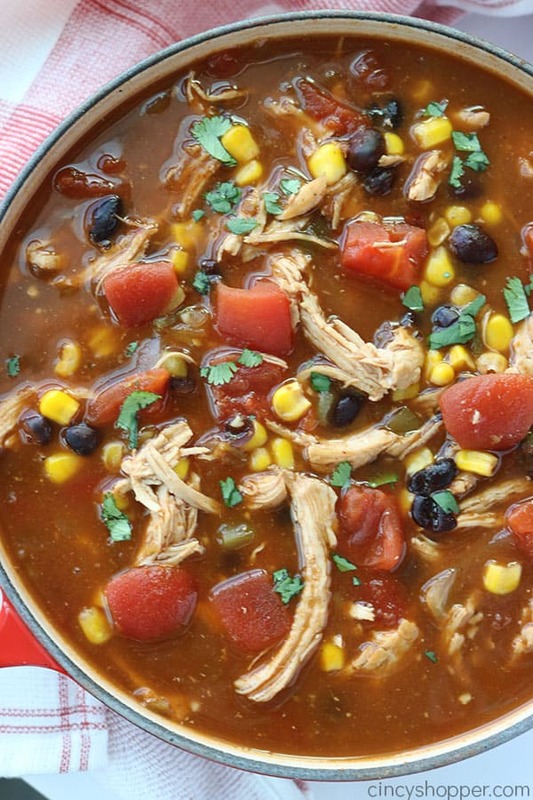 You can make Chicken Tortilla Soup for potlucks. I have done this many of times in the past. I cook it all on the stove. I then pour it into a slow cooker to keep it warm. If you should decide to make this soup for a party or potluck, be prepared for everyone to ask you for the recipe. I have yet to serve it to friends or family and not had at least a couple of people request the recipe. Note: you can also use the meat of a rotisserie chicken instead of the breasts. 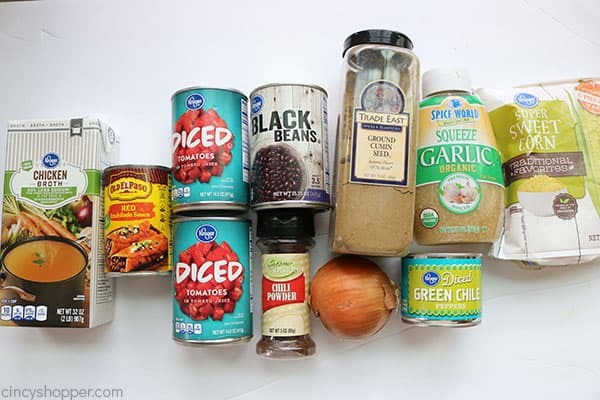 Combine all ingredients in a large pot and stir to combine. Cover and simmer over medium low heat for 45 minutes stirring occasionally. Serve topped with crumbled tortilla chips and fresh cilantro. 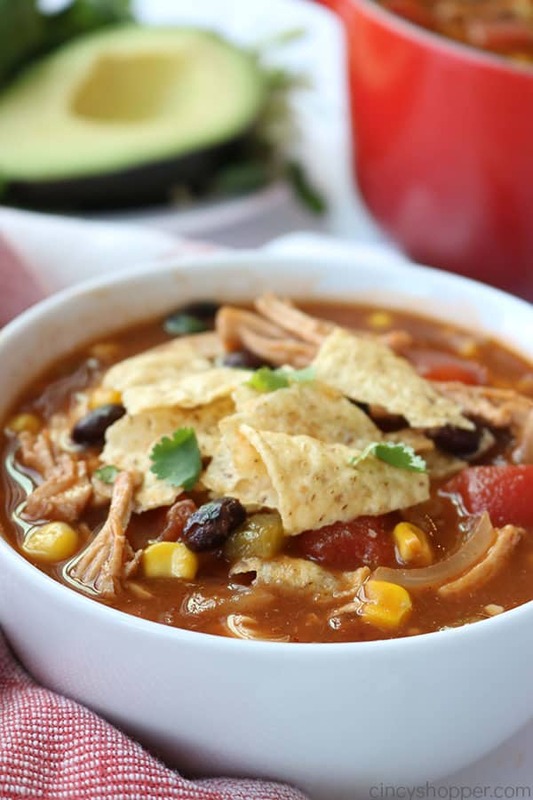 What additional toppings are great for Chicken Tortilla Soup? Go ahead and serve with shredded monterey or cheddar cheese, cheese on top is always great! Needing more spice? Add on some chopped jalapeno peppers. Those will make the soup super spicy for those who like heat. Serve with some diced avocados. I usually serve them on the side because not everyone is an avocado fan. Sprinkle on some fresh cilantro. Cilantro really gives the soup a real Mexican flavor. Add a dollop of sour cream to give your soup a bit of a creamy texture. You sure can! Just place your leftovers in seal-able container. I like to allow my frozen soup to defrost on the counter top. Sometimes I place it in the slow cooker on low for about 6 hours to reheat. 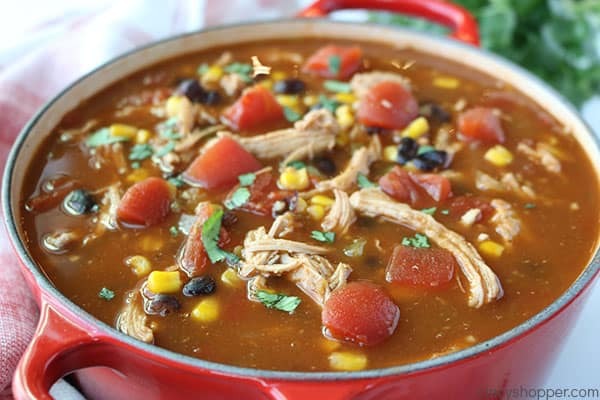 Can I make Chicken Tortilla Soup in the CrockPot? Most definitely! 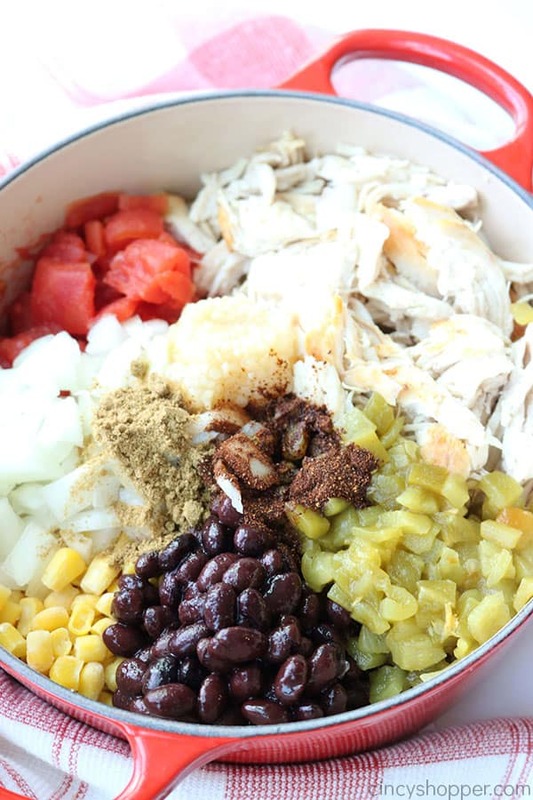 You can use this exact recipe by placing everything in your slow cooker. Then cook on low for about 8 hours. I find that the soup tastes best when made on the stove top. 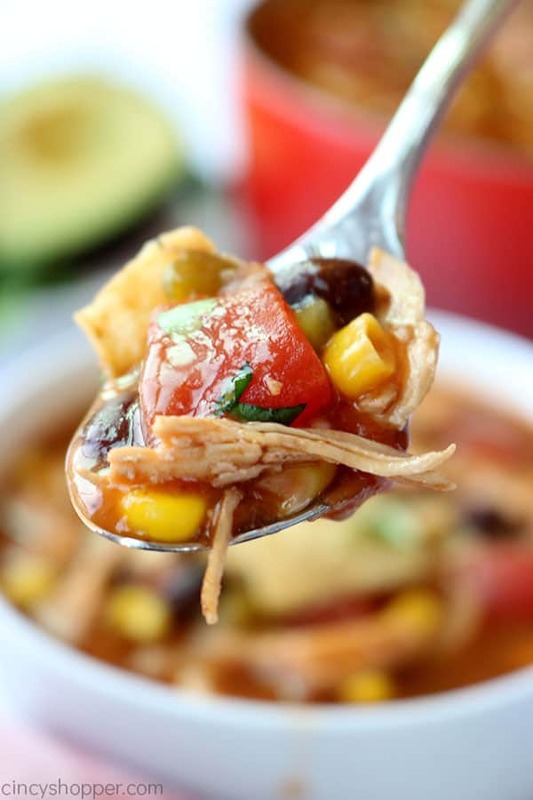 If you are looking for an easy and hearty soup recipe, you will want to make this Chicken Tortilla Soup. 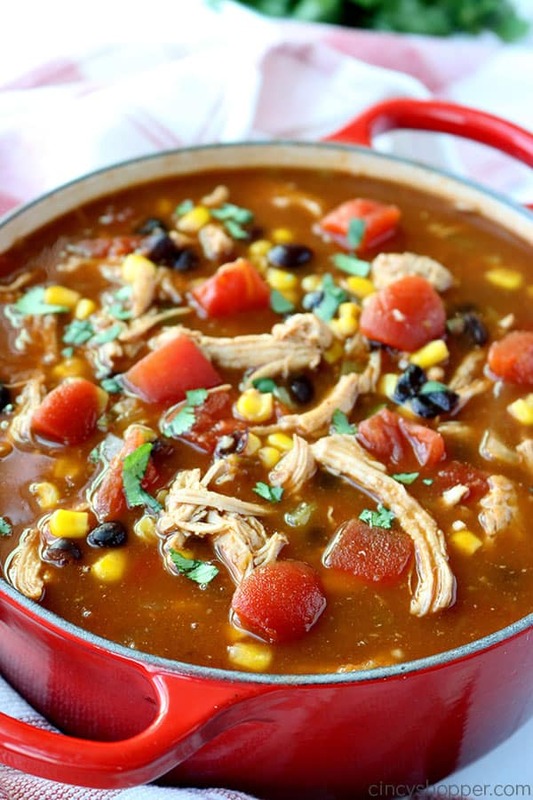 It's loaded with shredded chicken, tomatoes, corn, black beans, onions, and green chilies, all in a tasty broth. We then serve with crushed corn tortillas. Add in some additional toppings or enjoy as is. I am so hungry right now and this would hit the spot! Thank you for sharing on Merry Monday! We hope you will join us again next week! This soup is one of my family’s favorites, however… one little addition I like to make is to mix a rue of water and masa flour and drizzle that into the boiling soup. Not only does it thicken the juice a little, but it also adds a little tortilla flavor to the soup.